The end of a transition period - the new CLP regulation for substances and mixtures enters into force as from 1st of June 2017! Bargain weeks at Buzil. Save on the price of floor care products, not on the performance. 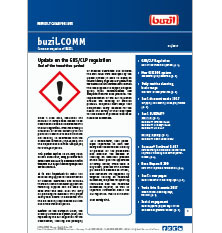 These and further interesting topics you can read at buzil.COMM, the customer information of Buzil. Buzil – perfectly clean for sure.